i’ve been working all day on creating my ideal game antarctica. mainly i’ve been researching what it looks like without ice, which thanks to modern technology we can figure out. 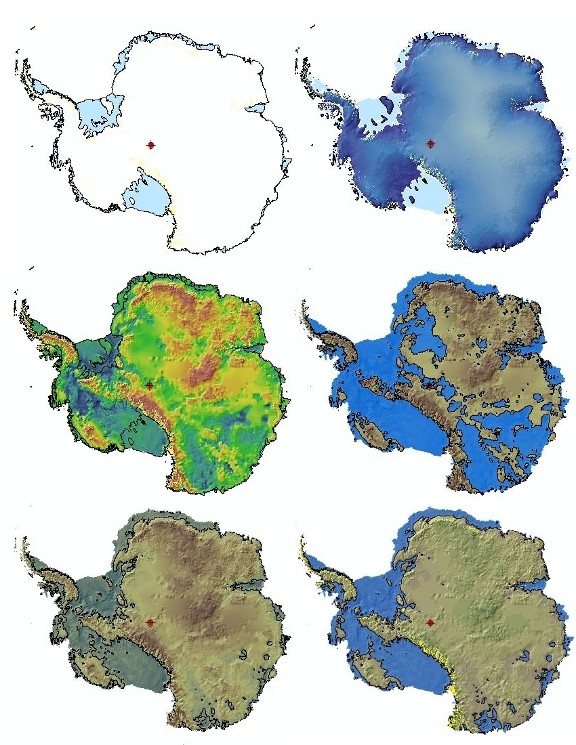 the picture above shows the plain raster outline of present day antarctica, which is mainly ice sheet with a few mountains. the second picture is a topographic of the ice. the third is the underlying topology of the bedrock, underneath the ice – subglacial. some of it is under sea level. this is shown in the fourth picture, which is a differently colored third picture to make sea level more apparent. the fifth picture is the isostatic picture of how the land will rebound once there’s not a mile and some of ice on top of it. and the sixth picture shows the sea level rise (80m) that occurs when you melt off all the ice, presumably all over the world. personally, i like the fourth picture, with all the water and all the islands. i’ll probably use something in between the two, but i am not fond of the huge landmass idea. we’ll see how it works out. it’s only a cosmetic issue, but as we know, half of a video game’s attraction is the artwork. while discussing the horizontal level with jim – which is where i’ve left off in the plot – i realized that i can combine all four horizontal worlds into one actual world, which would save one hell of a lot of work just describing it in the novel, never mind coding the game. this means i have to go and tweak this part of the plot, so i will do that and reissue it. it’s cool to do this at this stage; it becomes a lot more difficult once you’ve actually built the world and let the testers run wild in it. i guess in the horizontal level people can play both parts. they can play the evil alien vampires, i mean the banksters, corporate execs and wealth-hoarders. they can play the police and the army and the teapartiers, out to maintain the status quo and the rest of us can play progressives and occupiers and other radicals out to change the world. Posted on December 5, 2011, in antarctica, author's note, game, plot. Bookmark the permalink. Leave a comment.